Grenada is one of those places that just sounds romantic reading about it. Christopher Columbus was the first explorer to land here, during the third of his four epic transatlantic voyages in 1498. Did I mention you can get married there as long as you’ve been on the island for three days? Many assume that Grenada is a single island, but in fact there are three. The smallest has the cutest name, Petit Martinique. It’s a tiny, rocky place with few places to eat or accommodation. 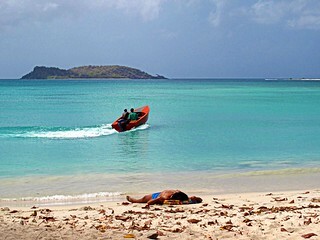 Carriacou is the second largest, with its main town of Hillsborough. Coral reefs surround the island so snorkelling and diving are big activities; otherwise, this is the place to just chill out. You can go hiking into some of the hills and get spectacular views, as well as potter about around some of the remains of the former plantation houses scattered around the island. But yes, if you can, one can just lay out on one of the beaches all day without a care. L’esterre is sometimes called Paradise Beach, and is a popular one with tourists. But if you go, more than likely you’ll find yourself spending time in on the main island. This is, naturally, where the airport is, as well as the country’s capital City, St George’s. But there are things to see all around the area beyond the confines of the major tourist strip, Grand Anse Bay. It’s possibly the most pristine and calm two miles of sandy seafront in the Caribbean. Because it’s sheltered, you get some very peaceful waters and you’ll have plenty of choice for resorts and accommodation here, meaning you’ll also likely get good value for money. Waterfalls are another Grenada must – you could make a whole day or two of just scouting out the best. Concord Falls are the local favorite – the hike up into the mountains makes the final ‘reveal’ of the falls as you come around the corner just spectacular; the hike is worth it, as you get three falls for the price of one. The Mt. 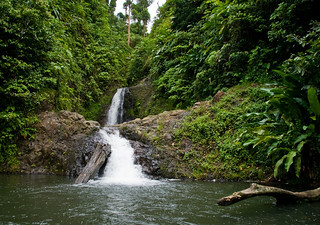 Carmel waterfall is a little easier to access and the highest one in Grenada. Tufton Hall is a nice one as well but slightly more difficult to access – you’ll need a guide. If you’re a museum person, there aren’t any official “museums” on the island – the ‘Rome Museum’ is more like a collection of great antiques than a proper gallery. Fort George offers a fantastic view and some information into a slice of the islands history, as it changed owners a couple of times before becoming a British Commonwealth today. There are a couple of plantations – the Belmont Estate and the Dougladston Estate both offer great experiences to learn about the history. 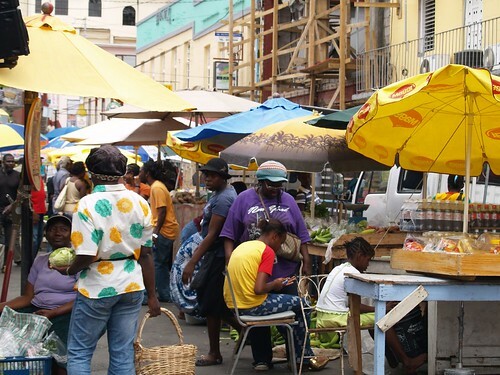 You can also visit some of the spice and rum factories, though really if you aren’t that keen a stroll through the market on a Saturday morning can also be just as a rewarding experience. The thing you’ll notice when you first arrive in Grenada, whether by cruise ship or air, is the air. The smell. It’s so sweet and fresh and clean. I often wonder if Christopher Columbus detoured on his transatlantic voyage – as he was known to do – buoyed by the scent of the Spice Isle. Andy Hayes is a travel journalist currently based in Edinburgh, Scotland. When not criss-crossing the world to have his next travel adventures, he is spending time hanging out on his own website, Sharing Travel Experiences. You can also visit one of the most significant Carribean chocolate producers and manufacturers: Grenada Chocolate Company who do tours. They’re only a very small company but have done exceedingly well exporting their chocolate all around the world. You can see the entire process there from the growing, harvesting, roasting, winnowing, grinding, conching, refining, tempering, molding … well worth a visit!